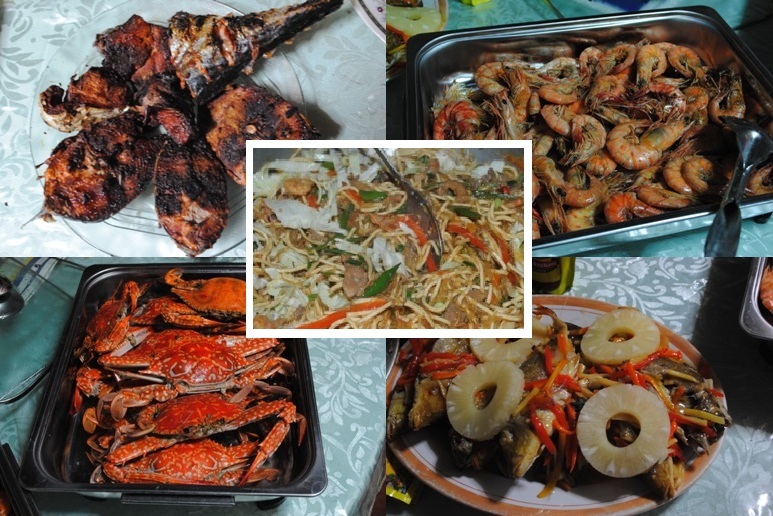 it was my special request that we would have seafoods. i just got tired of chewing pork. -_- and the almost burnt tuna was my fault. 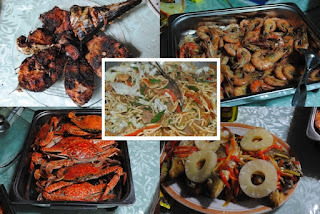 ^^ ever present in every birthday, a pancit (noodle food) for a long life! he was a bit tipsy in this. he was wearing the jacket that was kinda large for his size. breinn and i hurriedly bought this one in olympic village in ayala during our lunch break. and this was even on sale! perfect. the jacket was my mother's gift to my father. and the crocs courtesy of wrengyll, my brother. my father was holding the razor and cream given by erlene, my sister. just how thoughtful she can be sometimes! ;) and the black bag was of course given by me. ^^ the black bag was just a spur of the moment buying. one time i bought a bag in marithé et françois girbaud and they had this promo that they would slash off 50% on your second item. sweet.